Performance based sound system design and installation is a serious science and an art combined. Each performance based venue must be treated as unique with thought given to many factors that impact the movement of sound through a room. We use the latest computer modeling software called EASE to provide a visual model of the room and help understand all anomalies that may exist. Additionally a thorough understanding of how the human ears and brain process sound stimuli and knowledge of how to reinforce what is performed on a stage accurately to each listener in the room. Proper system design starts with an understanding of the movement of the sound waves and the response of the listener to receiving the reinforced sounds and not with a litany of electronic equipment. Speaker integrity and placement is critical. Let us design a quality sound system for your venue. Matching the speakers to the room is critical to clear transmission of sound to each listener in the room. To facilitate understanding the results of any given speaker system we utilize EASE acoustical analysis software. From the data we glean after reading the results provided by a number of different research models we can see in advance of installation how the speakers will perform in the room. 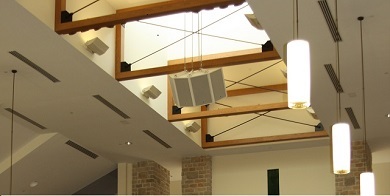 The picture above show an example of a high quality point source computer modeled speaker cluster installed in a church Sanctuary. shown here is a Renkus-Heinz T-Series array. After completing the design process it was determined that steerable array speakers were the best option of this large cathedral. Shown here are Renkus-Heinz Iconyx arrays. the result of this installation was intelligible sound at each seat in the room. 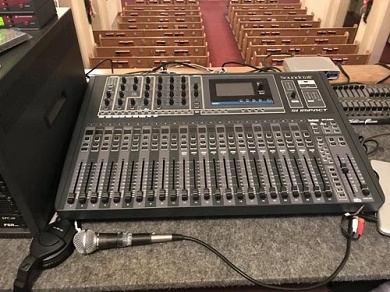 The heart of any quality sound system is the signal processor. The equalization functions all the designer to match the signal reaching the speaker to compliment the acoustical characteristics of the room. Additionally features such as signal limiting, compression and sometimes crossover functions are available. the DSP provides an essential tool for the design engineer to make the system and room work together to provide a high quality listening environment and control feedback. These settings are done using pink noise and high quality sound analysis equipment as adjustments are made to the DSP device. Shown here is a dbxPro 4820 processor. To drive the speakers requires a properly specified power amplifier. Too small of an amplifier will result in too low sound levels which results in an inadequate listening atmosphere and ultimately possible amplifier failure. Too much amplification can result in blown speakers if the system is driven beyond is total combined device capability. Poor quality amplifiers can also result in poor fidelity and issues with feedback control. We specify high quality amplification products and take care during the design process to match the amplifiers and speakers to the demand requirements of the venue. Shown here is a Crown Audio I-Tech Series power amp.